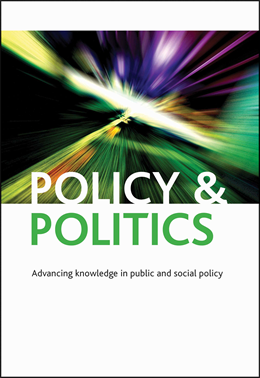 Policy & Politics 2016 best article prizes announced! We are delighted to announce the 2016 prizes for award winning papers published in Policy & Politics in 2015. The winner of the Ken Young prize for the best paper overall was awarded to Michael Howlett, Ishani Mukherjee & Jun Jie Woo for their 2015 article entitled ‘From tools to toolkits in policy design studies: the new design orientation towards policy formulation research’, Policy & Politics, 43 (2), 291-311(21). The winner of the Bleddyn Davies prize for the best early career paper was awarded to Owen Corrigan for his 2015 article entitled ‘Conditionality of legal status and immigrant occupational attainment in Western Europe’, Policy & Politics, 43 (2), 181-202(22). Brief critiques of the winning articles follow, written by Co-Editor Felicity Matthews in celebration of their contribution. In this expansive and impressive paper, Michael Howlett, Ishani Mukherjee and Jun Jie Woo offer a comprehensive analysis of the field of policy-design and implementation, charting its evolution over six decades from a narrow focus on individual policy tools to broader accounts of multi-faceted policy toolkits. In doing so, the authors are able to impose a sense of chronology and logical order upon a wide, varied and dynamic body of literature. The paper identifies several temporal dimensions, contrasting the optimistic rationality and modernity that characterised the ‘old’ study of policy tools, with the increasing pessimism of the governance and globalisation turn, which witnessed a shift in academic attention away from government and towards the market and civil society. It then moves on to identify a renaissance in the study of policy tools, characterising the ‘new’ field of inquiry as being concerned with the multiple tools and tool mixtures used by government actors to address society’s most intractable problems, and how these mixes have evolved over time. This paper stands out as an exemplar of a ‘Research Provocation’. The paper draws upon the authors’ decades of academic experience, and brings together over 180 different academic sources, to deliver an expert synopsis of the evolution of this key sub-field. At the same time, the paper identifies a number of salient cleavages within the ‘new’ study of policy toolkits, highlighting critical differences within contemporary scholarship in terms of the various ways in which complexity, contextuality and temporality are understood. In doing so, this paper sets out a research agenda that carves a path between the hyper-modernism of the ‘old’ study of tools and the hyper-pessimism of the governance turn, and ensures the relevance of the ‘new’ policy toolkit approach to the study of policy design and implementation. In this empirically salient and methodologically rigorous paper, Owen Corrigan seeks to address an important – but hitherto overlooked – issue: the effect of state policies governing the legal status of migrants upon their occupational attainment. In doing so, he develops a compelling account of the unintended consequences of exacting criteria of citizenship upon migrant insecurity; and presents critical insights regarding the way in which policymakers can ensure meaningful occupational outcomes for migrants, which in turn contributes to their integration within their host country’s society. To substantiate this argument, the paper develops an innovative ‘citizenship conditionality index’, which is then used to qualify the policies governing the legal status of migrants across 14 western European states. Using data from the EU-SILC and MIPEX datasets, these policies are subject to further interrogation, the results of which demonstrates a significant and negative relationship between increasing levels of conditionality and decreasing levels of occupational attainment amongst the legal migrant workforce. The paper is commendable on a number of levels. Theoretically, it makes a clear and complementary contribution to the field of migration studies, illuminating the connection between citizenship and economic participation. Methodologically, it develops an incredibly useful index through which government policies can be assessed; and demonstrates the value of mixed-method research in a transparent and replicable manner. Empirically, it provides a series of key lessons regarding the way in which migration policies can result in outcomes completely at odds with their overarching goals – lessons that, in the current political climate, demand attention by politicians and scholars alike.